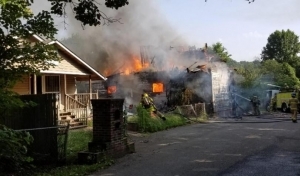 Fire crews in Knox County had a busy morning after a pair of fires. Firefighters are investigating after an abandoned home burned in South Knoxville. Rural Metro responded to 1215 Spruce Drive around 9:00 a.m.
Another working house fire, at 1215 Spruce Street. Per the units on scene flames are through the roof, please avoid the area and let our crews work. Officials say flames were coming through the roof. Their biggest efforts were focused on keeping the house next door from catching fire. Neighbors say it’s been three years since they’ve seen anyone living in the home. Earlier in the morning, Rural Metro responded to PSC Metals on North National Drive around 7:15. 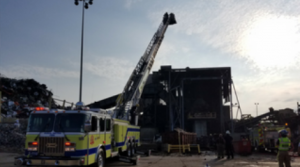 The fire was reported to be in a shredder which is used to break metals into fine particles. There was damage to conveyor belts and electrical lines, but no injuries reported. Rural/Metro Fire has an active fire at PSC Metlals, at 5205 North National Drive. Fire hoses are across the streets, please avoid the area. Officials are investigating the cause of both fires.